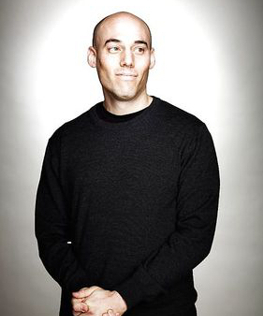 Born in 1974, USA, Joshua Oppenheimer is based in Copenhagen, Denmark, where he is a partner at the production company Final Cut for Real. Oppenheimer has worked for over a decade with militias, death squads and their victims to explore the relationship between political violence and the public imagination. Educated at Harvard and Central Saint Martins, his debut feature-length film is The Act of Killing (2012). His earlier works include The Globalisation Tapes (2003, produced with Christine Cynn), The Entire History of the Louisiana Purchase (1998), These Places We've Learned to Call Home (1996), and other shorts. Oppenheimer is artistic director of the International Centre for Documentary and Experimental Film, University of Westminster. - The Act of Killing (159 min, 117 min, 95 min - winner of 72 international awards, including the European Film Award 2013, BAFTA 2014, Asia Pacific Screen Award 2013, Berlinale Panorama Audience Award 2013, Guardian Film Award 2014 for Best Film; nominated for the 2014 Academy Award® for Best Documentary; released theatrically in 30 countries; screened in countless film festivals, including the Telluride Film Festival, Toronto International Film Festival, New Directors/New Films, and Berlin International Film Festival. ★★★★★ "...this film is just as piercingly and authentically horrifying as before. It is filmed with exactly the same superb visual sense, the same passionate love of the Indonesian landscape, and dialogue exchanges are captured with the same chilling crispness." ★★★★★ "A superior work of confrontational boldness... 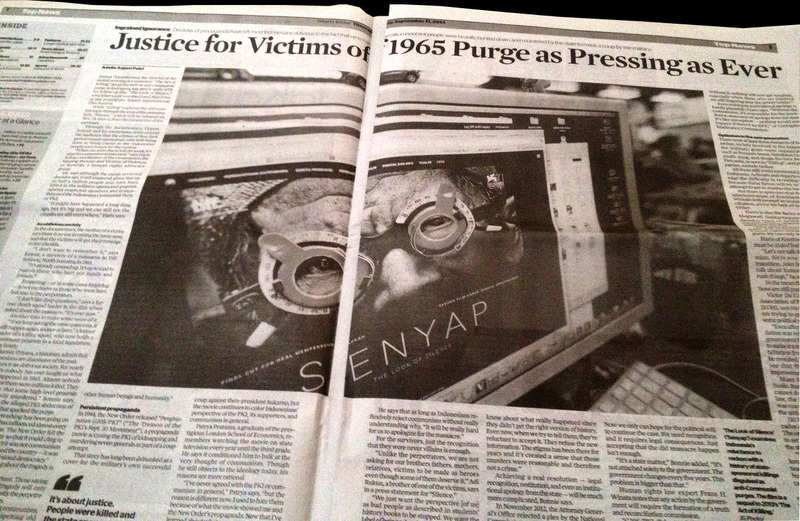 Essential"
"Many people in Indonesia still wish the tragedy will be erased with time. But movies, books and whatever form of warning will always be there because the death of a million people in a mass killing is way too much to sweep under the carpet." ★★★★★ "Oppenheimer and his anonymous collaborators are to be roundly applauded for bringing this appalling moment in history to light." Scott Tobias: "The film shows unfathomable courage in the face of unfathomable evil"
Noel Murray: "A riveting, poetic film"
★★★★★ "The follow-up to last year's The Act of Killing is as disturbing as it is mesmerizing, and replaces the weirdness and humor of the first film with emotional turmoil of a victim's family"
★★★★★ "The photography this time qualifies The Look Of Silence as a truly cinematic experience, one in which its raw emotional power is matched by its beauty." 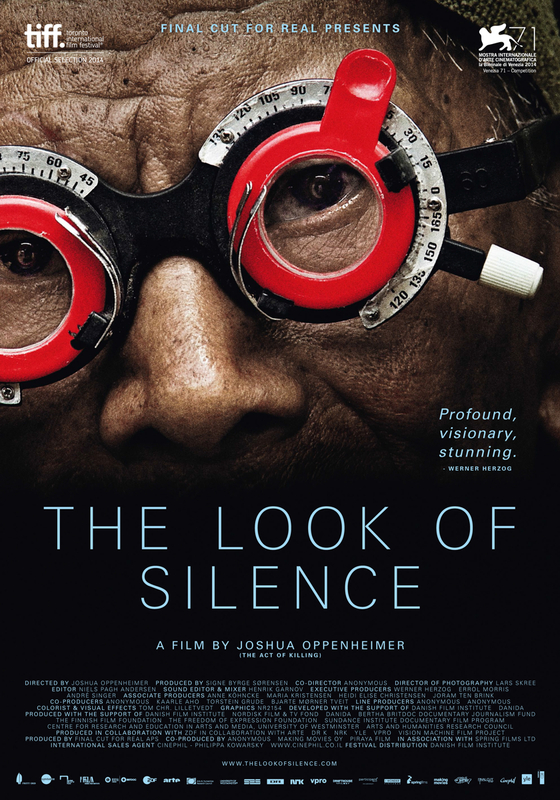 The Look of Silence awarded by the Danish Arts Foundation: "The Scholarship Committee for Film awards Joshua Oppenheimer for his film 'The Look of Silence' for the film's artistic precision and filmmakers' great courage in the depiction of mass murderers and their victims. The film is a proof that the artistic experimental documentaries in the right hands can shed light into the darkest chapters of our history and give us the ability to read human emotions in all their diversity behind the bare historical facts." 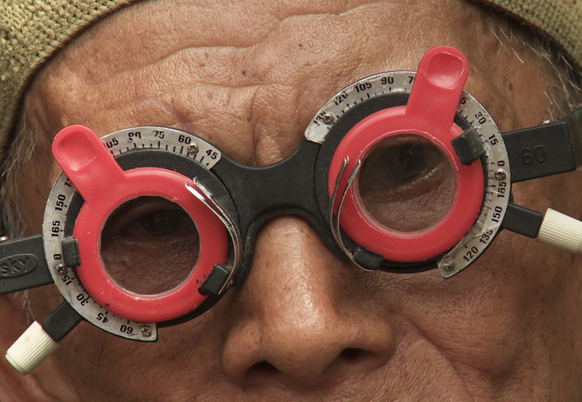 The 2015 Dragon Award for Best Nordic Documentary has been awarded to Joshua Oppenheimer for The Look of Silence. The jury’s motivation: "The award goes to a film which breaks the barriers between documentary and fiction, by opening up space for a performance of history. Using the camera to confront memories, and inspire reconciliation, this film's look at the tragic past shapes a nation's view of the future. 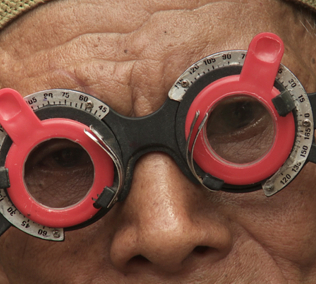 The Dragon Award Best Nordic documentary goes to The look of silence by Joshua Oppenheimer." Everything comes together in the final confrontation of the film, in which Adi visits the family of one of Ramli’s murderers, including his widow and sons. Oppenheimer is mentioned or addressed at several earlier points of the film, but this time he’s directly invoked, and there’s no forgetting his presence. With so many people in the room (and possibly one less camera than he’d had for other scenes), the camera moves a bit haphazardly from one face of denial to another, from an alternately forgetful and apologetic old woman to a young man impatiently asserting that it’s best, and safest, to “leave the past in the past.” We’ve seen Adi threatened before, both subtly and bluntly, but never by a contemporary, by someone not directly responsible for the atrocities, who’s also lived under the long shadow of the genocide, albeit from an opposing side. But there’s a charge in the room that the camera captures, and it’s terrifying. “I don’t want to see this,” says one of the sons, when confronted with Oppenheimer’s footage of his father boasting of his blood-curdling actions. Do we? 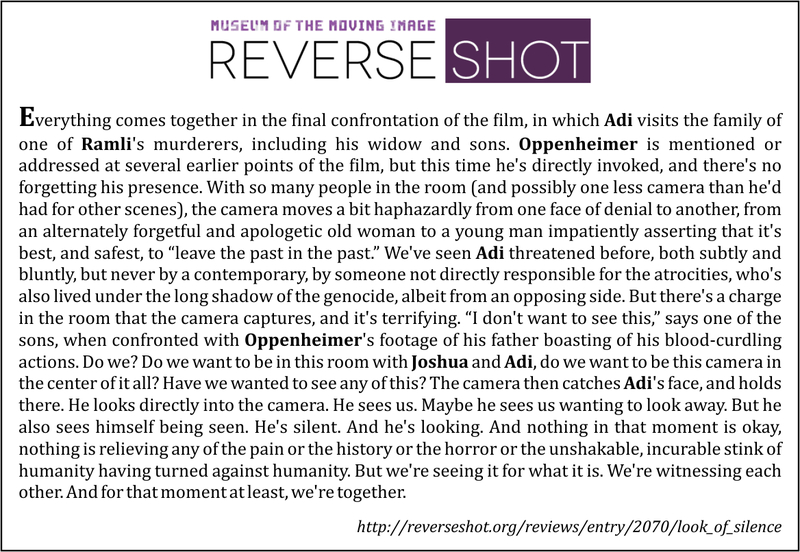 Do we want to be in this room with Joshua and Adi, do we want to be this camera in the center of it all? Have we wanted to see any of this? The camera then catches Adi’s face, and holds there. He looks directly into the camera. He sees us. Maybe he sees us wanting to look away. But he also sees himself being seen. He’s silent. And he’s looking. And nothing in that moment is okay, nothing is relieving any of the pain or the history or the horror or the unshakable, incurable stink of humanity having turned against humanity. But we’re seeing it for what it is. We’re witnessing each other. And for that moment at least, we’re together. 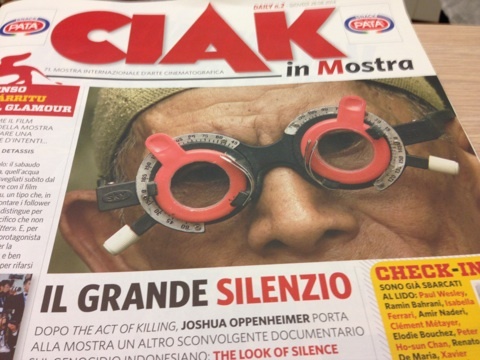 "Why 'The Look of Silence' is the Year's Most Important Oscar Nominee"
"Why Adi Rukun Risked His Life To Make 'The Look of Silence'"